My favorite vegetable is carrots by a long shot – raw, cooked, in soup, whatever. I am always looking for new ways to make sure I get my carrot fix. This is one of my favorite soups. You can eat it hot or cold. It has some interesting ingredients (lemongrass and Kafir lime leaves) that you can find at most Asian markets or you can leave them out. You can play around with different toppings such as toasted almonds or pumpkins seeds. 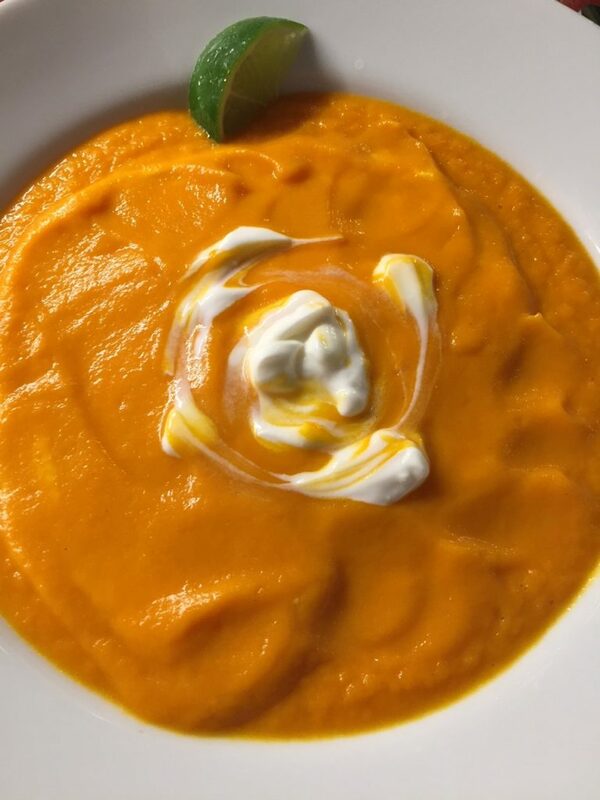 You can also make this soup with butternut squash in place of the carrots or use half and half. Heat oil in a large soup pot or Dutch oven. Add the carrots, onions, lemongrass (if using), and salt and cook until tender over medium heat (about 15 min.). Do not let the mixture brown, adjust heat as needed or add a bit of water. Add the stock, curry paste, ginger, and lime leaves (if using). Cook for about 20-30 minutes until very tender. Puree with a handheld blender, in batches in a blender, or in batches in a food processor. Add the lime juice and adjust the seasoning. Top with yogurt and serve with lime wedges.